When you think of cabin crew, a certain look springs to mind. Immaculate make-up, hair piled on top of the head and a jaunty scarf tied at an angle. I was asked by the guys at Monarch to create my own cabin crew inspired look, so this is my take on #FashionForwardFlightwear. What I found out when researching their uniforms were the sheer amount of different looks that cabin crew have worn through out the decades. From capes to hats, there have been a variety of looks over the years. Interestingly enough this fashion week many designers were inspired by the old air hostess uniforms, did anyone see the Chanel show? With this in mind I went for a 60s style uniform, I’m extremely inspired by the 60s and 70s at the moment so this seemed like the perfect decade to try and re-create. I actually think the older uniforms were much more interesting than what cabin crew have to wear these days. I find that a-line dresses are really flattering on me, so I went for this red number from Topshop. I love the zip and pocket details, making it a little more interesting than a plain red dress. My coat, also from Topshop, is the perfect partner.. The red and orange check with a mix of black and white, is pretty striking. The pvc details on the collar and pockets are a lovely added detail. Tying all the colours in like this definitely makes me think of uniforms, I could see this on a 60s hostess. What do you think of my #FashionForwardFlightwear? How would you update the cabin crew uniform? 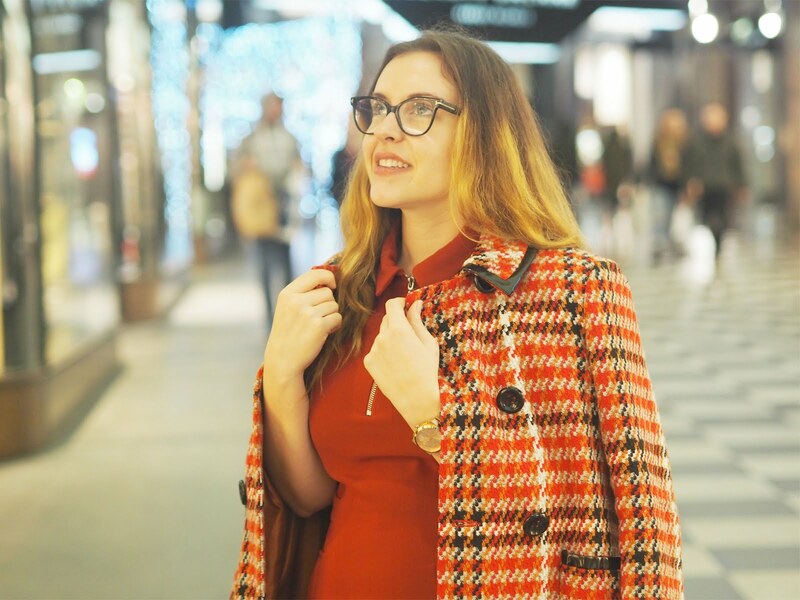 "Event: La Redoute SS16 Press Day"
I can't get over how gorgeous you look! I love the little nod to the 60s vibes of cabin crew attire. You look amazing! Loving this look. Beautiful autumnal colours and very 60s! LOVE this coat. What a cute idea for an outfit.